Moving has been classified as one of the most stressful times in a person’s life. Add in all of the logistics of moving out of state, and you have a recipe for an even more stressful event. How successful, and how stressful, your move will be will be dependent on how well you prepare beforehand. The earlier that you start preparing, the better chance you have of having a problem-free move to a new state. Here is a list of 10 steps to help you prepare for you upcoming out of state move. Start by doing your research into various interstate moving companies. Request quotes and ultimately make a decision on the moving company that you feel will work best for you and your unique situation. As soon as you have made a decision on a moving company, be sure to book as soon as possible to ensure availability for your dates. Those who are planning a big move are strongly advised to establish a budget to help monitor moving costs and expenses closely. The biggest portion of your moving budget should go towards paying for your professional movers. There are also going to be a lot of expenses that aren’t going to be as obvious, that can make the difference between a cost-effective move and an expensive one. Be conscious of any additional moving services that accrue additional fees and charges. When you are preparing to move to another state, think about what items you’ll want to take with you and what you’ll want to dispose of prior to your scheduled move. Now is not the time to take everything you own with you, as it will be expensive, not to mention, you’re probably not going to need or use everything you own. Go through your home and take inventory of the items that you are going to take with you, and what you’ll be leaving behind. Don’t be afraid to be ruthless here, as it is your moving budget that is on the line here. After you have taken inventory of your home, you can start to reduce the number of items that you are going to need to move. You should completely purge your home of any items that you intend to get rid of prior to starting to pack your home, so you don’t accidently take those items with you. Arrange to sell unwanted items either online or at a garage sale to get some valuable cash. Useable items that don’t sell, can be donated to friends or charity organizations. Now that you have purged your home of unwanted items, you are ready to start packing. Packing is going to take a substantial amount of time, therefore, there is no time to waste! Start packing up your home as soon as you can, so that you are ready for your professional movers when they show up. Be sure to follow a good packing list, and prepare an essentials box a day or two prior to actual moving day. Before leaving for your new home, in a new state, you’ll need to arrange to get the medical records for your entire family. This will help you in registering with a new physician when you arrive at your new home. The key to having a successful interstate move is to stay a few steps ahead. When you move into a new home, you’ll have a new address which means that you’ll need to change your address with the USPS, this will ensure that your mail gets forwarded and hopefully nothing gets lost. Also, be sure to cancel all delivery services that you are currently subscribed to, along with any subscriptions or memberships in your current location. Aside from having a new postal address, you will also need to establish your home utilities with the new corresponding companies. You’ll need to schedule to have your current utilities turned off the day following your move, and arrange to have your new ones turned on prior to moving in. Moving out of state with children and pets present another challenge, that ensures you’ll have your hands full. Your number one priority during moving is to ensure the safety of both your children and pets, especially on moving day. Also, try to minimize disruptions to their normal daily routines. Try to arrange your schedule to accommodate their needs and do everything that you possibly can to mitigate their fears. After you’ve interviewed various interstate moving companies, and made a decision, your possessions will have their transportation to your new home arranged. Now it is time for you to plan and arrange for how you will be getting to your new home as well. Are you going to be driving to your new home, or are you going to be catching a plane? Determine how you intend to get there and make a plan to get there on time to greet your moving truck. If you are planning an out of state move, contact White Glove Moving & Storage for a quote. As the premier moving company in New York and New Jersey, you can rest assured that you will be getting a professional moving company that will not only take care of your belonging, but will take care of you. 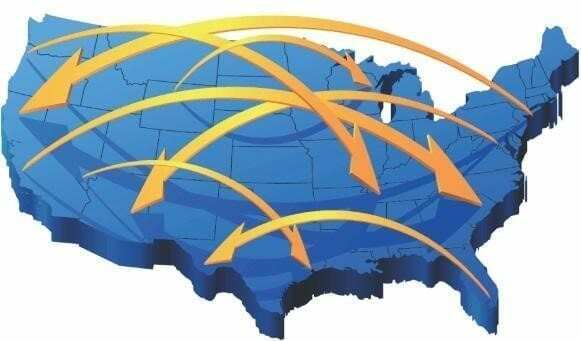 Contact us today to learn more about how we can help you with your upcoming interstate move.